" Hilton and Over the Rainbow "
Date & start time: Sunday 18th August 2013. 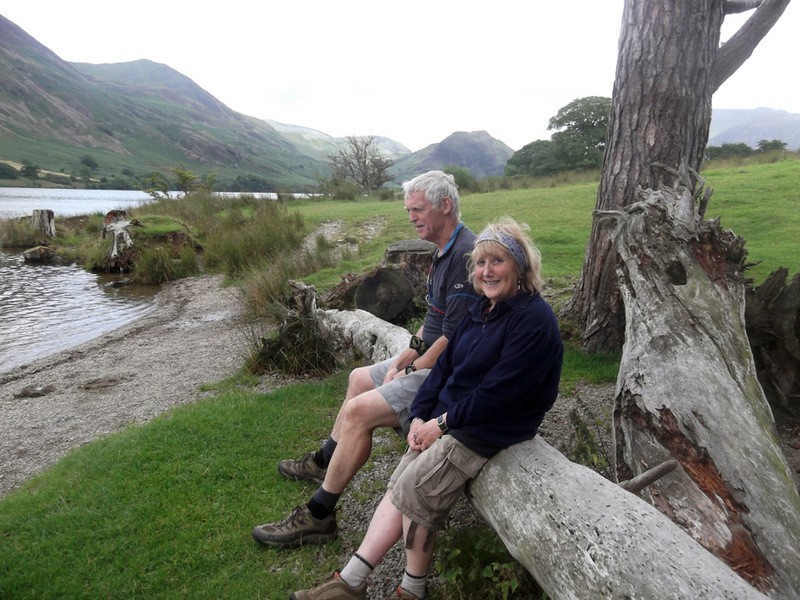 Places visited : Crummock Water and around home. Walk details : A local walk . . . we didn't note the time. Highest point : Meeting friends and enjoying the greater delights of the weather. 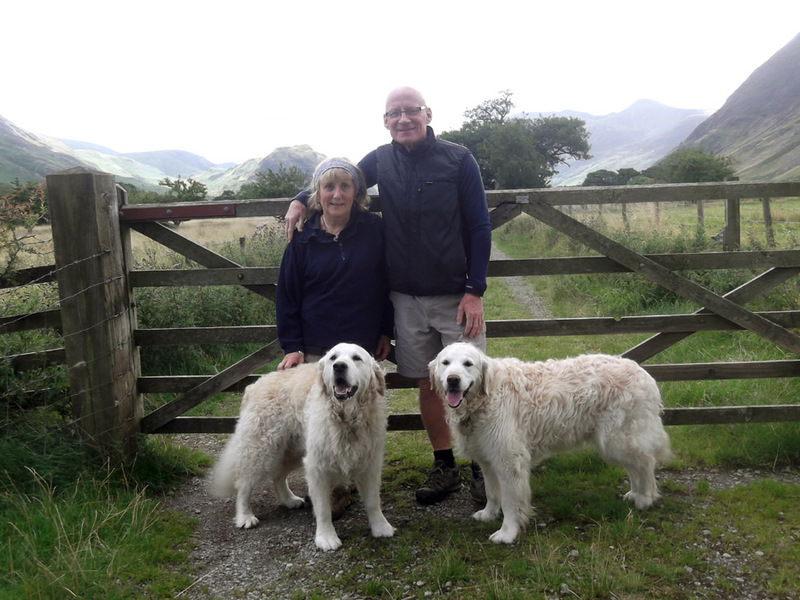 Walked with : Hilton, Ann and the dogs, Harry and Bethan. 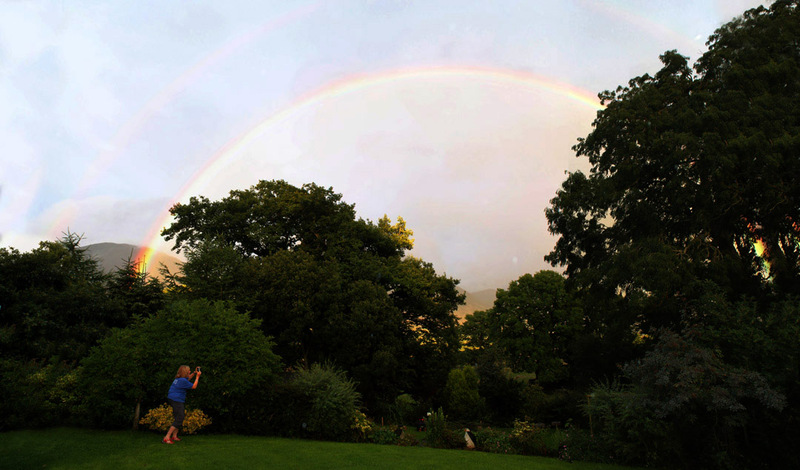 Weather : Sunshine and showers. It's been a busy few days with friends this week and our friend Hilton was visiting over the weekend. on a more watery-blue rather than a sunny-yellow day. Hilton has been a great friend over the years, having known Ann since college days. Mmmm . . . that mean's he's known Ann longer than I have . 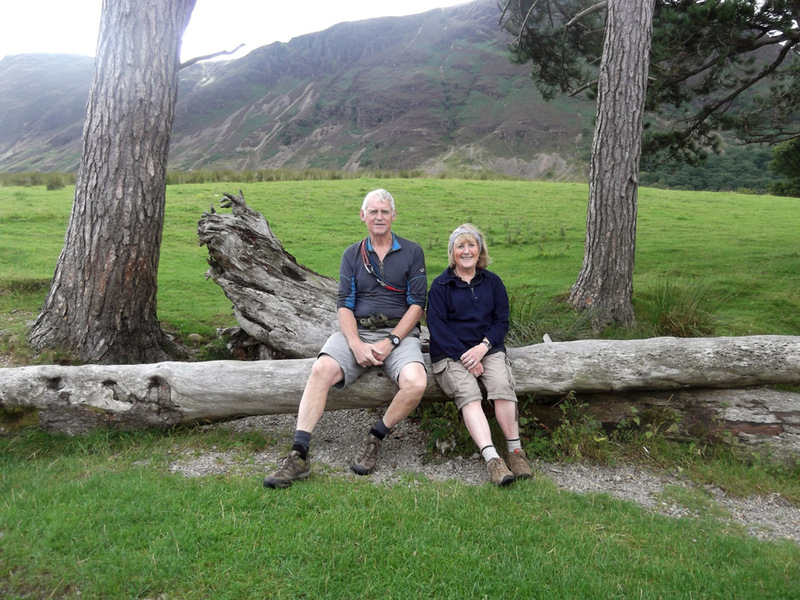 . . and I've been married to her for over 34 years !
" A photo log of the walk "
Chance for Hilton to try out his new camera. In fact it is his old camera . . . it is just that now he actually owns it. It also takes landscape pictures too . . . 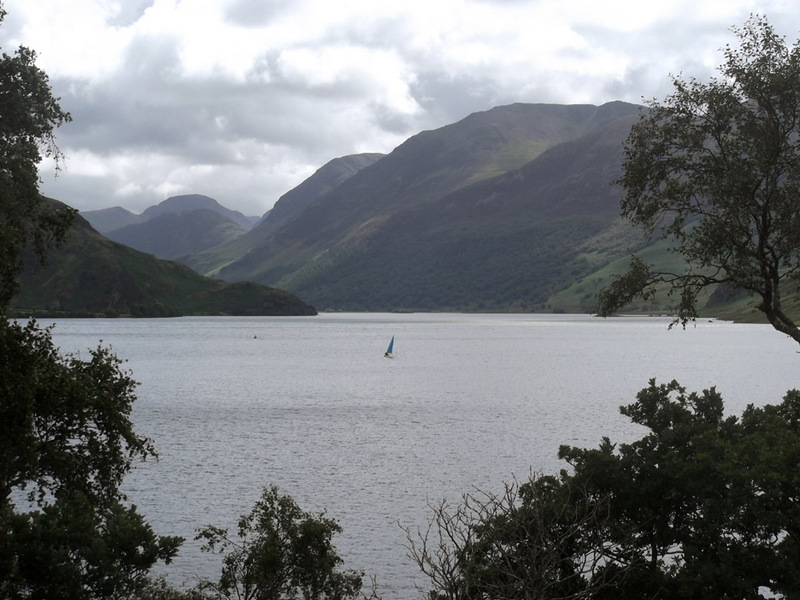 This is Crummock Water looking up to the High Stile Ridge and past Buttermere to Haystacks and Great Gable. 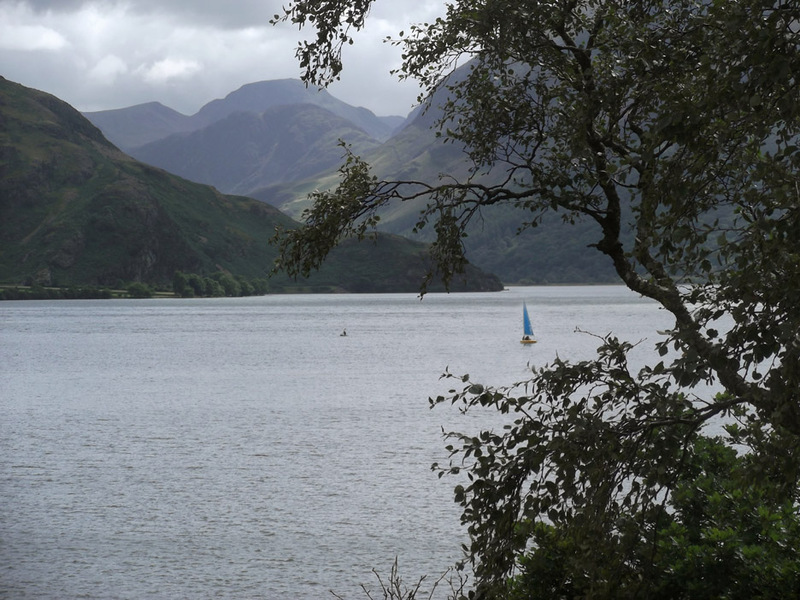 There's a small sailing boat on the lake today which is relatively unusual as there is no easy place to launch. There's a canoe too, but I don't know whether they are out there together or it is just a coincidence. Back via the 'gated-road' . . . the Water Board track from the lake with half a dozen or so gates, each to open and shut on the short walk back. Thanks to Hilton or downloading these photos before he left. 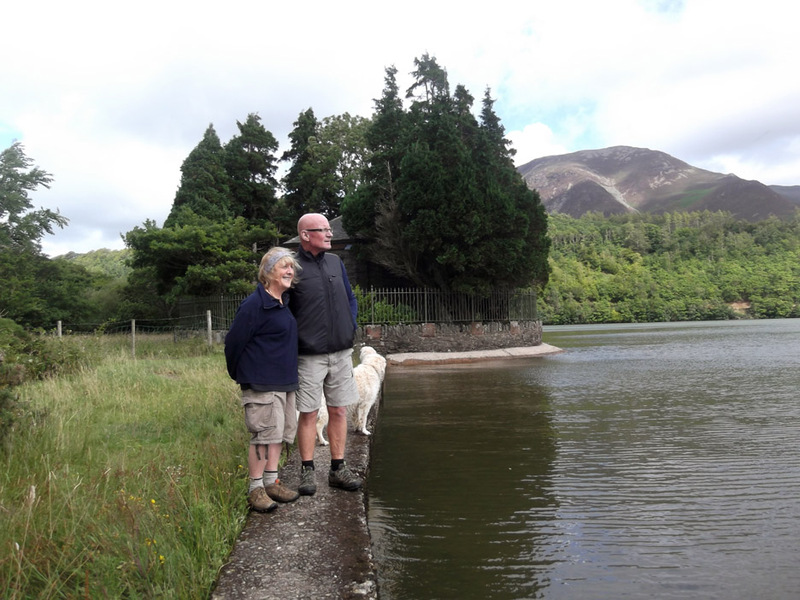 Last week we were blessed with one of the " wonders of nature " here in Loweswater. 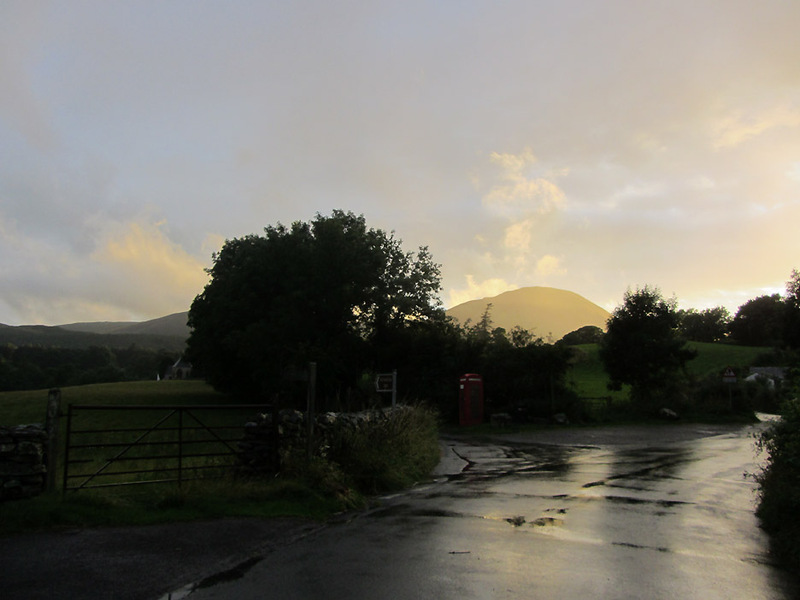 Sitting quietly enjoying our evening meal we noticed that the sun had burst through a rather water-laden sky . 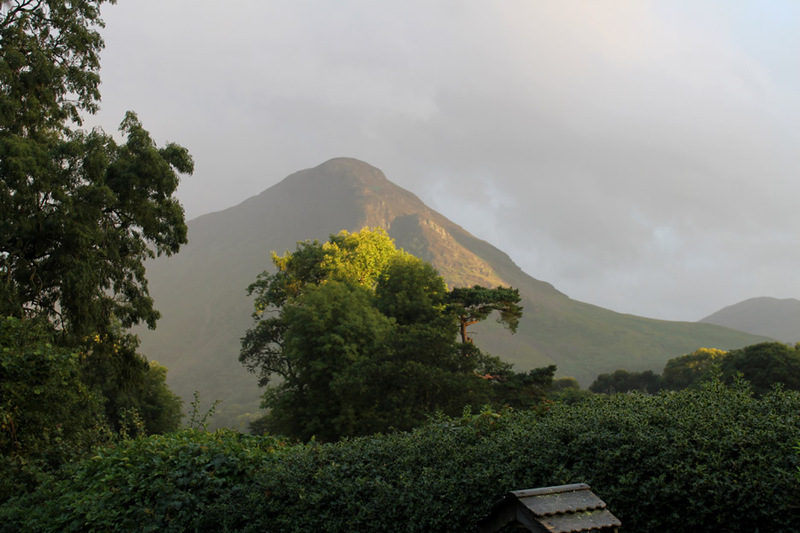 . .
and wondered what it would look like out the back of the house as there's often a nice 'sunset effect' on the hills around us. Make sure your speakers are turned on and click the start (>) button above. Many thanks . . . please do carry on viewing . 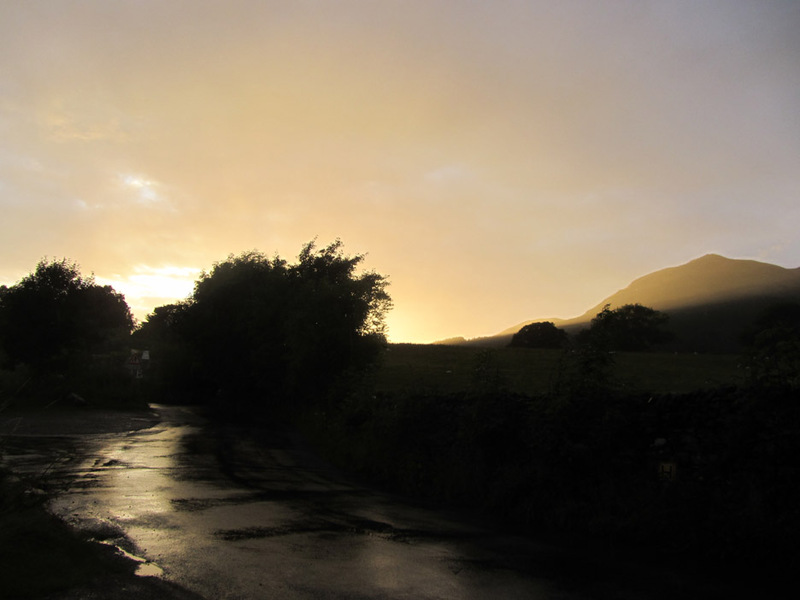 . .
Sure enough, the bright sun following the rain has lit up the side of Mellbreak. It has also lit up the tops of the trees . . . but not with that bright red "Ayres Rock" effect we sometimes get. 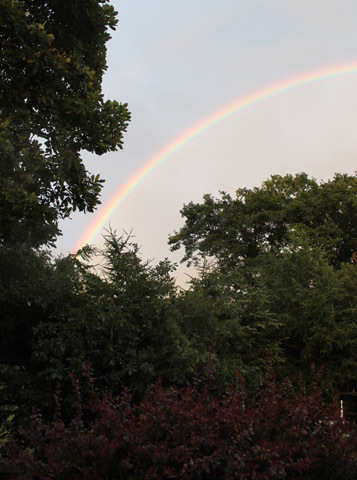 Instead it was the brightest, most superb rainbow we had seen in months . 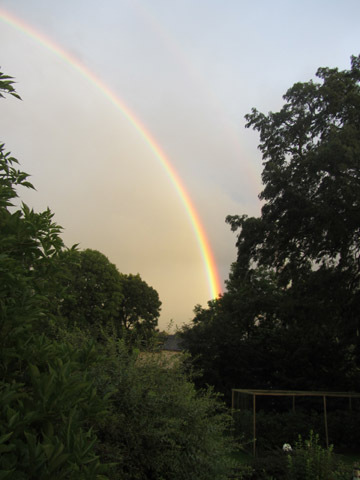 . . possibly ever seen from here in the garden. 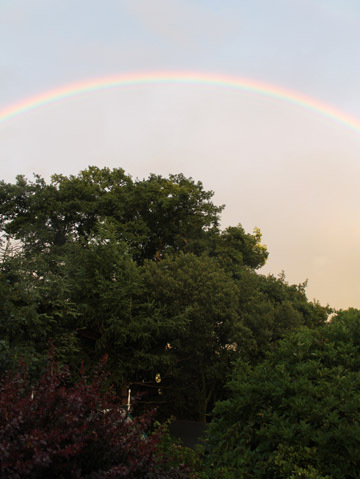 The problem with photographing rainbows is that they have a wider arc than the average field of view of a normal camera. Technology came to the rescue to provide us . . . and you . . . with the big picture. The brightest of colours. . . the complete spectrum. 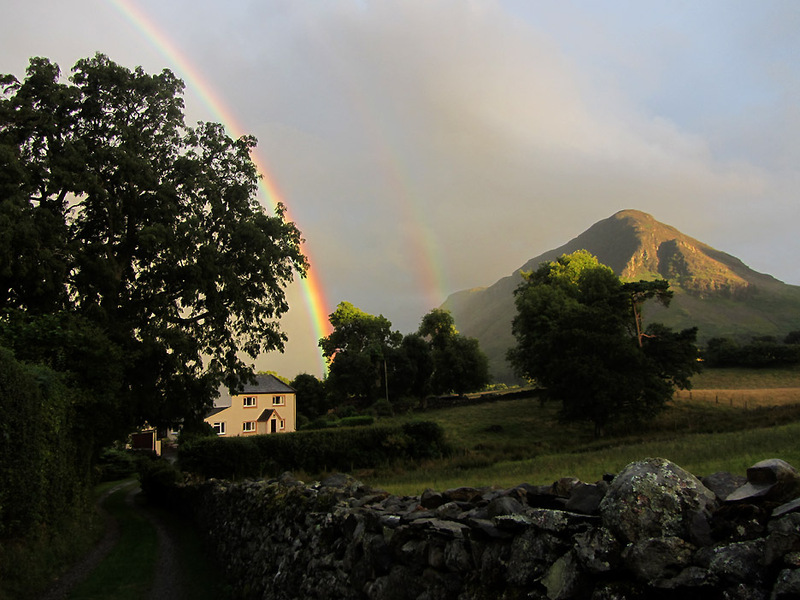 To see the light on the fells we went out onto the road to get a wider view . . . away from the trees. 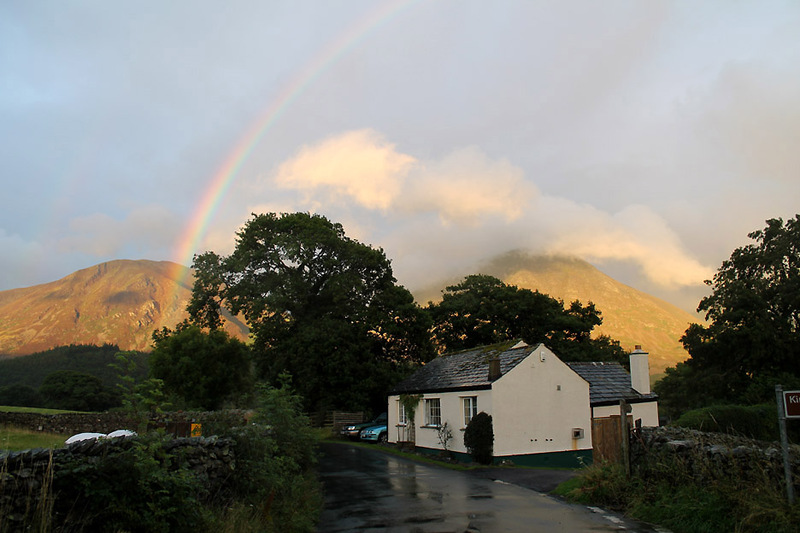 The rainbow landed between the house at Gillerthwaite and the northern summit of Mellbreak. 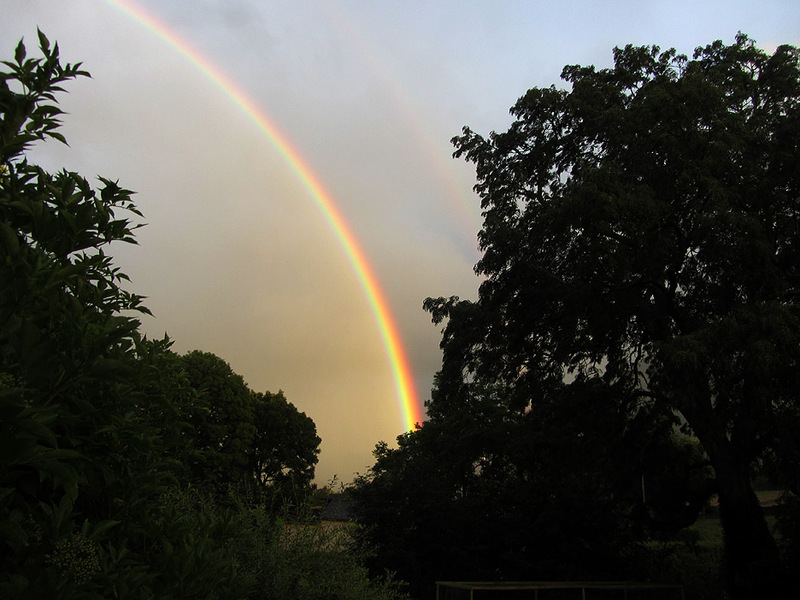 A hint of a double rainbow as the light is reflected and refracted a second time. 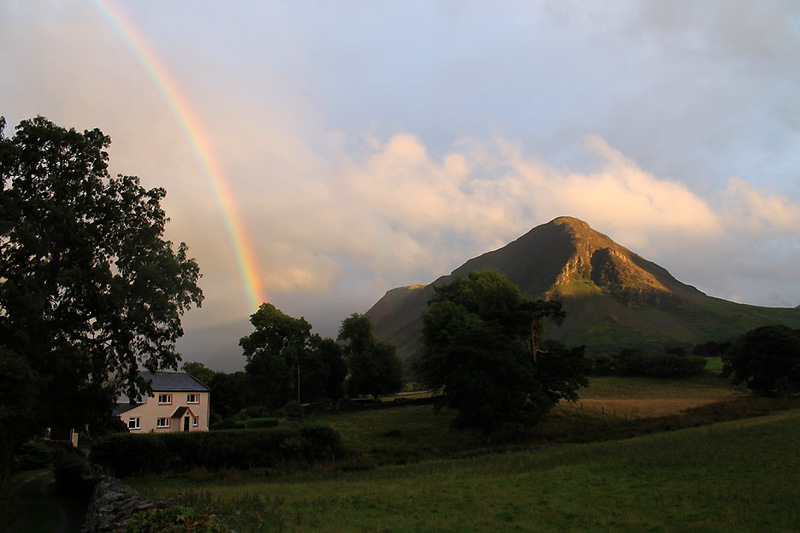 The complete rainbow sitting squarely over the cottage . . . without the need of a safety net . . . or special red shoes.
. . . and a cold pudding ! This site best viewed with . . . now where did I put that spoon . . . is it over there in the camera bag ?